Has your doctor told you there is nothing else you can do? Major hospitals are now using this new technology every day. Finally, you can use this technology in your own home. See how it helped kathy, a patient of DR. Wirick. My feet are 90% better. The ReBuilder is a medical device that will reeducate your nerves that affect your feet and legs, so that they conduct the necessary signals better and thus reduce or even eliminate the symptoms of Neuropathy that you are now experiencing. Neuropathy is a problem with your nerves. (“neuro” meaning nerves, “opathy” meaning problem). The most common symptoms are constant or shooting pain, burning, numbness, and tingling. Peripheral neuropathy means the symptoms are in your feet or hands. Sensory nerves, which carry messages to the brain. Motor nerves, which carry signals from the brain to the muscles. These nerves work by converting heat, pressure, etc. into electrical signals in the extreme ends of the nerves, called dendrites. If they are starved for blood, they cannot do their job. When these signals reach the body of the nerve cell, that cell determines if the signal should be ignored or sent up to the brain for evaluation. If the cell has been poisoned by toxins, it can be overly sensitive and send pain signals when there is no pain or ignore important pain signals resulting in numbness. The nerves do not actually touch each other. They are separated by a fluid filled sack called the synaptic junction. Once the signal reaches the end of the nerve, it must jump across this fluid. Pure, distilled water is not conductive, so the body infuses this fluid with minerals it gets from nearby blood vessels to make the fluid conductive so the electrical signals can jump across this gap. When these series of peripheral (meaning arms, legs, etc.) nerves reach the spine, they connect with the synaptic junctions of the central nerves (spine and brain) and continue up to the brain for evaluation. The brain determines the proper cautions to take to remedy any traumatic pain such as stepping on a nail by sending a signal down the motor nerves to the leg muscles to quickly lift the foot off the nail. The brain also monitors the blood and lymph flow to provide the best environment conducive to keeping all the nerves healthy by opening or closing blood vessels, adjusting the heart rate, controlling the body’s temperature and breathing, and reaction to stress. Diabetes causes blood loss, sensitivity, and numbness in the tiny nerve endings, blood vessels, and capillary endings in the skin. Statins, Chemo, agent orange, smoking, some prescription medications, aluminum, and fluoride cause damage to the nerve cells themselves. Physical impingements in the spine or inflammatory swelling in the limbs. Surgical or traumatic injury resulting in an actual break in the nerve path. Poor management of excessive stress. Obstruction in the lymphatic circulation system resulting in an accumulation of toxins. Demineralization of the synaptic junctions between nerve cells. Identification of dysfunctional nerve waveforms. Disuse muscle atrophy of the calves that reduce blood and lymph circulation. Poor sleep patterns resulting in low oxygen levels feeding the nerves. What elements are needed to effectively Mitigate Neuropathy? Blood flow needs to be restored to the skin of the extremity with symptoms. Blood flow needs to be restored in the veins from the extremity, to the heart. Lymphatic circulation needs to be restored. Physical impingements need to be identified, reduced, or eliminated. The nerve path needs to be restored. Strengthening calf muscles to restore circulation of blood and lymph. Re-education of the nerve cells to create and transmit healthy waveforms. Remineralization of the synaptic junctions needs to occur. A strong enough electrical impulse to jump the gap in severed nerves. A strong enough electrical impulse to jump the gap in demineralized synaptic junctions. Sleep aid to provide proper oxygenation to the nerves. Counseling with medical providers to reduce intake of toxins. The entire area of the foot or hand must be treated. The device should be safe and simple to operate. How does the ReBuilder meet these objectives? 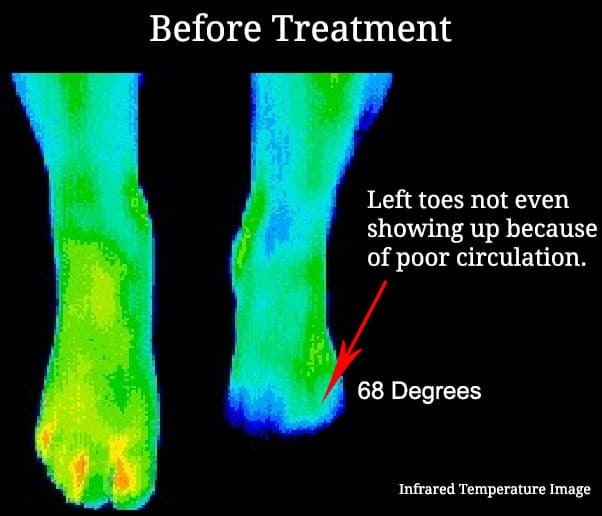 By warming the feet via the warm water foot bath, blood flow to the capillaries and tiny arteries and veins in the skin is enhanced. 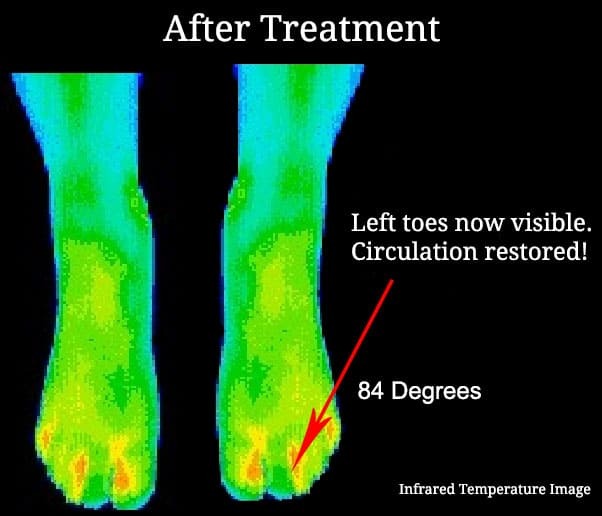 The water in the foot bath becomes the electrode of the ReBuilder, thus the entire surface of the extremity is treated. The warm water foot bath with the ReBuilder electrolyte provides the exact ratio of minerals that the synaptic junctions need and these minerals are absorbed into the extremity where needed via the opening of the capillaries due to the temperature of the water and via electrophoresis: the process of driving minerals transdermally, electrically. By creating a unique compensating waveform and delivering it to the nerves 7.83 times per second, the nerves are gently coaxed back to producing and transferring healthy waveforms. The ReBuilder’s signals are stronger than normal nerve signals and thus can jump the gaps in severed nerves, nerves passing through inflamed, swollen tissues, and poorly mineralized synaptic junctions. The ReBuilder provides a simultaneous muscle stimulation signal to cause the calf muscles to contract and relax fully, thus restoring venous blood flow, lymphatic blood flow, strengthening the venous muscle pump, and eliminating disuse muscle atrophy. The ReBuilder delivers its signal 7.83 times per second and this frequency causes the brain to produce its own endorphins (as strong of prescription opioids but without any side effects) to reduce stress levels, and help the patient get to sleep faster, and stay asleep all night. The ReBuilder directs its therapeutic signals from one foot, up that leg, across the synaptic junctions in the lower back, down the other leg, to the opposite foot, thus reestablishing the proper nerve paths that may have been compromised by trauma, etc. If an area of physical nerve impingement is identified, the ReBuilder can deliver its signals directly to that area (such as the lower back, knee, shoulder, elbow, and hip) via its electrically conductive self-adhesive pads. The ReBuilder instructions provide helpful hints about toxins to be avoided such as Statins, aluminum, fluoride, etc. The ReBuilder measures the patient’s body mass, electrical resistance, voltage, impedance etc. in order to program itself to the proper safe levels of stimulation automatically, when the ReBuilder is first turned on. The ReBuilder is turned on and its intensity level is controlled by a simple old-style radio knob for ease of use. This way, even arthritic hands can adjust the intensity. (The waveforms, etc., are automatically adjusted via the internal microprocessors.) No glass screen to break. The ReBuilder uses a common 9-volt battery available everywhere to avoid the dangers inherent in the use and recharging of rechargeable lithium batteries that can be accidentally discharged when the patient tries to use it. If the common 9-volt battery has run down, it is a simple matter to replace it with a fresh one and resume the treatments. Click here to view FDA cleared indications. 94 out of 100 patients eliminated their pain, painful numbness, tingling, burning symptoms and better mobility was experienced with their first treatment. The most common comments were: "miraculous relief," "I can feel my feet again, " I am no longer suicidal," and "I have a life again." Unexpected comments included ulcer-healing in 3 patients, resolution of fungal nail infection in one, and improved sexual function in 3 patients. The ReBuilder has become the preferred standard of care in hospitals and clinics around the world! There are 55,762 doctors, 317 hospitals and clinics, and 2,187,663 patients using it at home (as of 2019). ReBuilder Medical Inc. has been solving pain continuously since 1987. "We kept increasing our pills until the side effects were worse than our pain. We were frustrated, then our doctor discovered the ReBuilder. No more pain, no more pills, and we feel great again! The ReBuilder more than paid for itself in co-pays, gas to and from the doctor's office, other pills to counteract the side effects of the pain pills, and... it gave us back all that time to go back to living!" "Thank you, thank you, thank you! As an actress and model, my career was about to be cut short due to pain. There was no real identified cause to treat. They first prescribed medication, which made me too sleepy during the day to sleep at night, so my medication was changed to another medication, and it caused short term memory loss, so I could not remember my lines. It also caused numbness. That numbness caused me to stumble on stage. Your ReBuilder was a godsend! My doctor did not know anything about the ReBuilder (which annoyed me immensely) but my ReBuilder has completely changed my life, and now I can sleep and remember my lines once more. Two of my friends who are major TV sitcom stars are now also using the ReBuilder successfully." Dr. Cory Aplin, Board Certified in Neuropathy, local neuropathy expert and author of “Reversing Peripheral Neuropathy” discusses his passion for helping people with neuropathy using the ReBuilder. The last thing we need is another medication bottle on our counter top. The ReBuilder – featured on the Heartbeat of America TV program. Produced by William Shatner(who stared in Star Trek and Boston Legal), and showcases companies that are making a difference and changing the world. The ReBuilder is shaping the lives of people all over the world. * LIFETIME WARRANTY & 1 YEAR MONEYBACK GUARANTEE! Unique one year guarantee to test it for yourself in the privacy of your own home. If it does not fit your situation for any reason, simply send it back, no questions asked for a full refund. Did any of your past therapies, medicines, etc ever offer to give you your money back if it did not work? The ReBuilder increases blood circulation immediately. Check out the 33 second video on the right which shows a visual of how your nerves look when proper blood circulation is flowing. Amazing results with first treatment. My son has chronic intractable pain, his feet were not only swollen but purple in color. I had to put patches on his spine because of the pain. The spine area was also discolored. It was unbelievable. He couldn't even walk right. Now his feet are almost normal in color. Before he couldn't even put slippers on, now he can walk and put shoes on. It's almost a miracle the way it works. I hope it doesn't stop working on him. He doesn't wake up crying every morning now (41 years old). He uses it two times a day and we have cut the drugs down considerably. This photo was taken before my son started using the ReBuilder. He couldn't even wear slippers. The pain and swelling went up to and included his knee. This photo was taken approximately one week after using the ReBuilder. We received the machine 04/15/05. His knees are no longer swollen. Amazing! No pain. Many primary care physicians are running out of prescription med options to control your chronic intractable pain. You may have noticed all the news coverage about opioid addictions, the ReBuilder can take place of these opioids when used in conjuction with your primary care physician and your physical medicine physician. We can refer you to a local physician who can help you immediately, click here to find a doctor or call for immediate personal help with a live medical professional on the phone. The ReBuilder is a covered expense under most insurance plans. What I have found is that consistently my patients that do ReBuilder get better results and faster. Now this Therapy is one of my all-time favorite therapies for any nerve problems. Thank you for all the support you have given me as I've used The Rebuilder for my neuropathy. This device has helped me so much. The numbness in my feet and lower legs is practically gone when I use the device on a consistent basis. I walk a mile, regularly, and I'm sure without this nightly treatment, I would be in a wheelchair by now. It's so critical to keep the nerves active, and this device does just that. I have idiopathic neuropathy, and the drs. don't have a reason and just prescribe drugs. The Rebuilder has given me hope that I will continue to walk.
" My name is Butch M. and I am a Disabled U.S. Marine Veteran and I am a Type 1 Diabetic. For the past twenty four years I have suffered with my feet. And one day I went to my Chiropractor for a normal adjustment. I happen to say how much numbness and pain my feet were giving me that day. Well long story short I was able with the help and kindness of ReBuilder Medical's to purchase a ReBuilder therapy device for use in my home. I have cut my use of pain pills in half each month since then. I can feel the socks on my feet and the shoes. But the best part is, when my wife puts lotion on my feet for me it’s all I can do to sit still. You see I have gotten so much feeling back that when she touches the bottom of my feet I SET THERE LIKE A LITTLE KID AND LAUGH BECAUSE IT TICKLES!! I also have a left knee replacement and both of my hips have been replaced. And your product even helps them. GOD Bless folks at ReBuilder Medical and that you very much.
" Feels like Spring !!!!! Nice warm day and I wore shoes I haven’t worn all winter and I wore them too long… Ouch! Realizing how sore my feet were, once home I immediately put my feet in the ReBuilder bucket. The almost intolerable discomfort was almost immediately remedied.! It’s wonderful having the ReBuilder around knowing I can use it for lots of different situations!
" I have used the product on three patients for pain control of peripherovascular origin. These patients have significant claudication,vis-a-vis chronic,debilitating and uncontrolled diabetes mellitis, and significant arteriosclerotic heart disease. The endorphin effect as provided by the TENS unit has been very satisfactory in cutting down any need for artificial analgesia and also has given the patients a significant sensation and feeling of well being, and their general compliance and attitude toward their disease has improved. The ReBuilder was invented by David B. Phillips, MD, PH.D. to solve the neuropathy symptoms of his father. Would you like a 10 minute consultation about your situation with a medical professional? Call us toll free at 877-717-5487. Note: Our phones are immediately answered by a real person, not a recording. We respect your time and know you prefer talking to a real person. Same ReBuilder 2407 but it comes with all these extra accessories. This professional model has Dual outputs to treat 2 areas at once. For example, if you have problems with your hands and feet, or lower back, or shoulders (any 2), this is your best choice. It comes with an A/C adapter that bypasses the battery that provides 33% more power. It has two additional modes of action: EMS, for specific muscle toning and TENS, for specific trauma treatment. This is the home device with a simple, single output that treats one area at a time, such as your hands or feet. The model 300 has a single knob control on/off and intensity, and fits in your pocket. In house financing, 0% interest, no credit check.